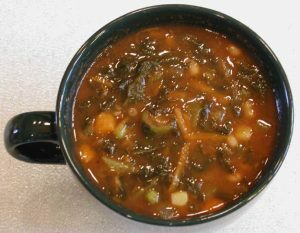 Collard greens vegetable soup (Italian style) makes a delicious vegan recipe to compliment any meal as a main dish or as an appetizer. This recipe will serve about 8 adults as a main meal when served with a large salad, and twice as many as an appetizer. Preparation and bringing the soup to a boil takes about 30 minutes, and simmering time takes another 30-45 minutes. Leftover soup can be stored in the covered soup pot or other covered container is the refrigerator for a few days. We prepare this soup in a large stainless steel stock pot, and store the leftovers in the refrigerator for the next few days to save us from having to cook. If you do not want such a large quantity, cut the recipe in half. Clean and peel one onion, the carrots, and the garlic. Cut the onion and carrots into chunks, and place the onions, carrots and garlic in the container of a high speed blender. Wash the celery and parsley. Cut two of the celery stalks into chunks and add to the blender container. Set aside the other two stalks of celery. Add the parsley and about two cups of water to the blender container. Cover and run at high speed until the veggies are pureed. Pour the contents of the blender container into the stock pot. Wash out any clinging veggie puree from the blender container into the stock pot with additional water. Add the oregano and hot pepper (if desired) to the stock pot. Bring to a boil, and let simmer. While the veggie stock is heating, peel and dice the other onion and dice the remaining celery and add to the stock pot. Continue cooking until the diced onions begin to get translucent. If you are using fresh collard greens, wash and cut (chop) at the same time as the onions and celery. If you are using frozen collard greens, hold their addition until after the onions become translucent. Add the remaining frozen vegetables at that time, too. Add the crushed tomatoes and continue heating until the soup begins to boil again. Simmer at low heat until the veggies are tender, then drain the beans and add to the soup, and continue simmering for another 5 minutes. Remove from the heat and serve. This soup, with a large salad, makes a great meal.